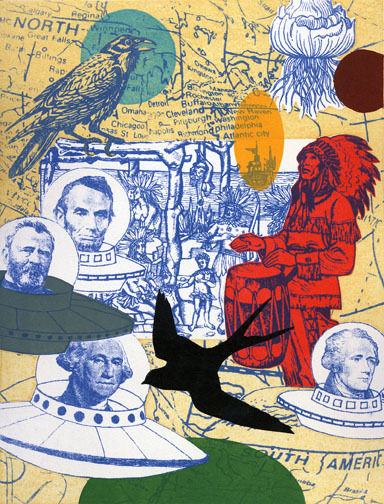 Consisting of 20 monoprints that explore issues related to an ever-changing political and cultural landscape in the Americas, the Percolator Art Space is presents, “Contested Territories” by Norman Akers, artist and associate professor of visual art at the University of Kansas. This exhibition will be on display at the Percolator Art Space in Lawrence from Sept. 25 through Oct. 24. Akers will give a gallery talk at 6:30 p.m. at the exhibit opening on Sept. 25. He also will give a gallery talk entitled, “Experiences of a Native Artist in the Mainstream,” at 1 p.m., Oct. 17. focusing on issues related to identity, stereotyping and expectations in the art market. “A few years ago, I began to explore other approaches to image making. The computer became a sketchbook where I developed digital images and collages. I began to use a variety of printing techniques including paper lithography and reduction printing. The use of gum arabic transfers from digital sketches and hand cut stencils allowed me to advance the layering process to achieve a new spatial and conceptual depth to the prints. The act of placing images on the printing paper echoes my desire to orient myself in the physical world. While painting allows images into my vocabulary at a contemplative pace, printmaking allows me to develop ideas quickly and to explore variations on new ideas,” Akers said. The prints make use of layered imagery, including early European prints and altered maps to create an alternate landscape. Akers’ work addresses the impact of colonialism in the Americas exploring issues related to identity and place. The vocabulary of our time with words such as indigenous, native, outsider, illegal alien and immigrant are used to define people’s relationship to place. The complexity of defining home, with the notion of belonging to or claiming a place in a shifting historic and political landscape has deeply influenced this body of work. As an Osage artist, Akers reinvents what it means to be a cartographer through paintings and prints whose nonlinear map images range from names of states, roadway lines, tribal oral histories, and flora and fauna. These qualities converge to express both a personal and cultural exploration in reclaiming a sense of place and home. The Percolator is located at 913 Rhode Island, in the alley north of the Lawrence Arts Center (south of East Ninth Street, between New Hampshire and Rhode Island). Look for the green awnings. The gallery space is open Saturdays and Sundays from 12-5 pm. Akers has had solo exhibitions at institutions including the Institute of American Indian Arts Museum, the Lawrence Arts Center, and the Carl Gorman Museum. He has been included in group exhibitions at the Katonah Museum of Art, Albuquerque Museum of Art and History, and the National Museum of the American Indian, among others. His works are a part of permanent collections at the New Mexico Museum of Art; National Museum of the American Indian; University of New Mexico Art Museum; Rockwell Museum; Eiteljorg Museum; Heard Museum; Gilcrease Museum; Museum of Contemporary Native American Art; Art in the Embassies Program, US Department of State, Yerevan, Armenia; Gardiner Art Gallery, Oklahoma State University; Fine Arts Center, Eastern Wyoming College; and Southern Plains Indian Museum. The Lawrence Percolator is the project space of the Lawrence Corporation for the Advancement of the Visual Arts. LCAVA is a 501(c)(3) nonprofit organization dedicated to bringing new art and cultural events to audiences in Lawrence and Douglas County Kansas. The Percolator is a community-based exhibition and performance space accessible to all members of the community.